Savvy buyers understand that there’s no such thing as a free lunch. There’s a reason why buyer rebates aren’t more common. That’s because listing agents are loathe to split commission with discount brokers. Plus, there’s no point in getting a rebate if it’ll make the seller resentful. Why would you want the seller to feel like he’s paying you commission? So how does one safely and discreetly receive a NYC broker commission rebate from their buyer’s agent without jeopardizing their deal? By working with one of Hauseit’s brand name partner brokers who never openly discount or tarnish their reputations in any way. As a result, our traditional, full-service partner brokers have great working relationships with the real estate community. How Much Could You Save with a Buyer Rebate in NYC? Buying a home in NYC? You can save up to 2% of your purchase price and reduce or eliminate your closing costs with a Buyer Agent Commission Rebate in NYC. Not only will you receive advice and guidance from one of our seasoned, highly rated partner brokers for free, they’ll pay you to work with them! NYC broker commission rebates are completely legal and non-taxable. Plus, you can earn a rebate on any listing in the city. So don’t let a listing agent bully you into dual agency so they can earn double commission! Sign up in under 2 minutes! Reputation matters – our network of traditional brokerage firms have great relationships across the broker community. Because our independent partner brokerages do not openly discount their services, sellers and listing agents won’t automatically know you’re getting a better deal! Quality matters – even though you never pay for buyer representation, the quality of this free advice varies greatly among NYC’s 50,000 licensed real estate agents. Hauseit’s partner brokers are among the most experienced, professional and highly rated real estate brokers in New York City. Our partner brokers come with years of experience not only in real estate but also in investment banking, management consulting, fixed income trading and corporate law. They are home owners and investors themselves who will help you navigate past treacherous waters and common first time home buyer mistakes. There’s no point in getting a rebate if everyone knows you’re getting one! Listing agents will be unhappy and sellers will automatically know you can pay more. That’s why Hauseit affiliates are truly independent, full-service traditional brokerage firms who do not openly or normally discount their services! Benefit from a buyer commission rebate without the stigma attached to a discount broker! What are the steps for buying a property in NYC with Hauseit's NYC broker commission rebate program? In today’s highly competitive seller’s market, it’s important that you, the home buyer, have access to every possible listing which fits your home buying criteria. Regardless of whether you are searching for a primary home or investment property which you’ll buy through a LLC, our professional partner brokers will ensure that you have full access to every on and off market property listing in New York City. Comparable Transaction Analysis: Our partner brokers may conduct a comparable property and transaction analysis between the listing you are interested in and similar units which are either on the market, recently sold, or currently under contract in the same neighborhood. Seller Intel: Your agent will conduct diligence on the seller and the current story surrounding the listing by connecting with the listing agent. We will attempt to find out whether any offers have been submitted and the nature of those offers, seller motivations for placing the home on the market, any special background surrounding the unit and board, the bidding process, and more. Macroeconomic Analysis: Your buyers’ agent will also analyze the current macroeconomic environment, including current interest rate conditions, regional economic data and unemployment figures, mortgage applications and home starts data, as well as the current regional volume of home sales to refine your bidding strategy in the context of the actual strength of the underlying economy and real estate market. Tired of dealing with sketchy discount brokers? We’ve secured private label discounts with New York’s finest brokers so you don’t have to! A home purchase is a major life decision. Work with a real broker. We’ve partnered up with the most experienced, brand name brokerages in New York so you can work with the best. After we’ve identified your target home and conducted market analysis to determine a bidding strategy, it’s time to prepare and present the offer. If you are financing the purchase, it’s very important to have a financing pre-approval letter along with a REBNY financial statement you can submit with your offer. If you submit an offer without this information in today’s seller’s market, you run the risk of being ignored by the listing agent. Keep in mind that it’s not uncommon for properties to receive multiple offers after only a few weeks on the market. Even if your bid is among the most competitive, you may not prevail if your financing package is not sufficiently comprehensive. Remember that real estate offers are not binding for either party until that party has signed the purchase contract! Submitting an all cash offer? Even if you aren’t seeking financing for your purchase, you may be required to submit proof of funds to the listing agent. Again, in today’s market it’s best to be thorough in your offer package from day one so that you can have the highest chance of prevailing over competing bidders. Buying a co-op in NYC? If so, you will definitely be required to prepare and submit a REBNY financial statement. Your Hauseit affiliated buyer’s agent will assist you in ensuring that this important component of your offer package is completed thoroughly. The seller and listing agent will use your offer and financing package to determine the overall attractiveness of your deal relative to the competition and quickly determine whether you’d have any issues passing the post-closing financial requirements of a co-op board. Once your offer has been submitted to the listing agent, there will likely be period of negotiation where the buying and selling parties will engage in deliberations to discuss the specifics of the deal including purchase price and other considerations (deal fees, financing package, mortgage contingency, sale or Hubbard contingency, any inclusions or exclusions, closing date, post closing possession by the seller etc). In all likelihood your offer won’t be the only one on the table. In the event that there are multiple competitive offer packages including your own, the listing agent may open up a second round bid process. Each party will be encouraged to submit a finalized offer package in a best and final offer auction style bidding process with no hard and fast rules for anyone. Once your offer is accepted, the listing agent will usually begin coordination for the closing process by circulating a deal term sheet for both the buyer and seller and their attorneys. Need a real estate attorney? Hauseit offers consultations with some of the city’s most experienced residential real estate lawyers. Because of the risk and large dollar amounts involved with real estate transactions, it’s important you don’t cut any corners when hiring the lawyer to represent you. Please read our guide on how to interview and what questions to ask your real estate attorney before hiring them. While your real estate lawyer continues to negotiate the specifics of the contract with the seller’s counsel, he or she will perform comprehensive due diligence on the legal and financial history of the building and particular unit you are purchasing. As soon as the negotiation and diligence is complete, it will be time for you to sign the contract for your home purchase. The standard market practice is for you also to deposit 10% of the purchase price into escrow (usually held by seller’s attorney) at the time of signing. If you are financing, this will be the time for you to submit the contract to your mortgage broker or bank in order to finalize the process of securing your home loan. Once your contract is signed, your buyer’s agent will help you to prepare your application and materials to be submitted to the board of the co-op or condo building you are purchasing a unit in. While the NYC coop board package purchase application process is much more challenging than for condos, it’s important that you treat either application as professionally as possible. A great buyer’s agent will ensure that you do exactly that. Once you’ve passed the coop board interview and been approved by the board and a closing date has been scheduled by your lawyer, you and your dedicated buyer’s agent will perform a final walk-through and inspection of the unit. This is the opportunity for you to identify any issues which have arisen since the contract was signed. During the final walk-through, your buyer’s broker will inspect things such as the fixtures and utilities to make sure that they are all in working order. 6. Close and get paid your buyers' agent commission rebate! The closing will typically be held at the seller’s attorney’s office if you are buying a condo or the managing agent’s office if you are buying a coop. At closing, your attorney will present you with the requisite list of documents for you to review and sign. After signing the documents and receiving confirmation from your bank that the loan has been funded (if you are financing the purchase), your home purchase will officially be closed. At this time, you will receive the keys to your new home and your broker will discreetly hand you that buyers’ agent commission rebate check. Best of all, the seller and listing agent won’t know you’re getting a better deal because none of our traditional broker partners ever openly discount nor tarnish their reputations in any way. Ready to get started? Visit our NYC broker commission rebate registration page to sign up for a free consultation in under 5 minutes! I’m already working with a buyer’s agent. Can I still receive a commission rebate if I sign up? Yes! Home buyers are free agents and can change their buyer’s agent at any time. Buyers are never required to sign any sort of Exclusive Right To Represent Agreement in New York City and you should be wary of any agent who asks you to do so. Even if you’ve signed a New York State Disclosure Form for Buyer and Seller does not mean you can’t choose a new buyer’s agent. The disclosure form is just that, a government mandated form which you can refuse to sign which simply acknowledges that you understand who represents whom. What do I do at an open house if I want to earn the buyer’s commission rebate? Before attending any open house, you should contact us right away so we may assign you an agent. Then, whenever you sign in to an open house you should indicate that you are being represented by your buyer’s agent. You can even go so far as to sign in with your buyer agent’s contact information to save you the hassle of being chased for feedback! It’s not a problem if you’ve already attended an open house without representation. You can choose to have buy side representation at any stage of your process! Should I tell the seller and listing agent that I’m going to earn a commission rebate? Absolutely not. One of the key benefits of working with an independent, brand name, traditional broker through Hauseit is that the seller and listing agent won’t automatically know you’re getting a rebate! Our partner brokerages work hard to maintain their full service, full commission brand image and great relations with the wider broker community. You’ll have the opportunity to work with a real broker plus discreetly receive a discount on your purchase! Yes. We actually encourage that you do this, because nobody knows more about your own goals and interests than yourself. All you need to do is identify yourself as being represented by the agent we assign to you at any open houses or property tours. There is no need to make an appointment to stop by an open house unless it is an open house by appointment only. You can simply search for and stop by any open houses on your own schedule! How do I get started if there are no open houses scheduled for the property I want to buy? If a property does not have any open houses scheduled or is holding an open house by appointment only, simply contact us to get started. Once we assign you an agent, you can either have your agent reach out to the listing agent to schedule a private showing or you may do so directly and indicate that you are being represented by your buyer’s agent. Are there any other fees or hidden charges that I need to pay the agent representing me? Absolutely not. Not only is buyer representation completely free, our partner broker will pay you $20,000 or more from the commission that the listing broker splits with your buyer’s broker. Will a seller reduce the asking price if I don’t have a broker representing me? Unfortunately no. In New York City, the listing agent will generally earn the entire 6% commission if there is no broker representing the buyer. So even if you deal directly with the seller, the terms of the listing agreement state that the listing agent will still earn and be owed the full 6% commission. It may sound hard to believe, but even if the seller finds the buyer directly through a personal connection, the listing agent still gets paid! If there is a buyer’s agent, then the listing agent would split (co-broke) the commission 50/50. This is where we can help you save. Our partner brokers split the buyer’s agent commission discreetly with you, enabling our partner buyers’ agents to actually pay you for working with them. What are the benefits of working with a buyer’s agent besides getting a home buyer rebate? Aside from getting paid to work with a highly rated and experienced buyer’s agent, having a buyer’s agent offers you the added protection of having your very own advocate and guide at every step of the home buying process. You’ll have an experienced real estate professional at your side who will help you navigate around common first time home buyer mistakes in NYC. It’s never a good idea to work directly with a listing agent if you are an unrepresented buyer, because he or she would then have to be a dual agent and simultaneously try and represent the best interests of both you and the seller. It’s tough and/or impossible to support both teams at the same time during the Super Bowl! Are you offering full service buyer representation or something else? Buyers who choose to receive a commission rebate through Hauseit will also receive full buyer support, including direct assistance and transactional support from our experienced partner agents for everything from arranging viewing appointments to negotiating an offer and submitting a co-op board package. Our agents are all specialists in the local residential real estate market and are eager to help you successfully complete your purchase. More specifically, your agent will assist with identifying and viewing suitable properties, negotiate and submit offers, prepare board packages, attend inspections, explain disclosures, and be at your side throughout the closing process in NYC. Can I earn a commission rebate on new construction or homes from builders? Yes. All major builders and developers welcome buyers’ agents, and since there is never normally any discount for individuals purchasing the property directly without an agent, the rebate is the best way for the buyer to save on the purchase and get paid. Before visiting any new construction, please contact us so we may get you started and assign you an agent who has plentiful experience with the type of property you are interested in buying. Then, whenever you visit the sales office for the new construction, you should state that you are working with a buyer’s agent. If you’d like, our partner agents can call the builder and pre-register you before you show up to tour the property. What is the catch and where is the misleading fine print? There is no fine print and no catch, whatsoever. You get paid to buy a house, it’s that simple. What is too good to be true is that the 6% broker’s fee has not been affected at all by the growth of mobile technology and the internet over the past 20 years! Does getting the commission rebate mean I need to find the home on my own? Absolutely not. Hauseit offers full service buyer representation through highly rated, highly experienced, locally based partner brokers. Our partner agents can help you find your perfect home, answer any questions, submit your offer and facilitate the negotiations. We will be at your side from the home inspection to closing. If however, you prefer to do most of the work on your own, that’s fine as well. Just contact us right away so we may get you set up. What is the standard commission structure for residential real estate in New York City (Manhattan, Brooklyn, etc.)? The typical real estate commission in NYC for sellers of a residential condo, co-op or brownstone is 5-6% of the sale price of the home. It’s not uncommon for brokers representing buyers and sellers of high end properties to earn more money in one transaction than the average New York City worker earns in an entire year! Is it too late to get a commission rebate on a property if I've already contacted the listing agent? You still have time! Please contact us as soon as possible so we may get you started and ensure that you will be eligible for a NYC broker commission rebate upon closing. We never recommend negotiating with the listing agent unrepresented because it would mean that the listing agent is then a dual agent and simultaneously representing the best interests of both the buyer and seller at the same time. This sounds hard to believe and it is. You always want an agent who has no conflicts of interest with you and the seller. You want to be represented in full confidence. Is it too late to qualify for a commission rebate on a property if I've already registered at an open house? It’s not too late! You have the right to choose buy side representation at any time. Please contact us right away to discuss your specific situation. It is legally required and part of REBNY’s rules for listing agents to allow buyers to hire a buyer’s agent after visiting a property without representation. The first step would be to contact the listing agent you have been corresponding with, mention that you want to work with a buyer’s agent for your own protection, and copy your buyer’s agent on the email. Do I need my buyer's agent to show up to every property viewing I attend? I'm ready to sign up for a NYC broker commission rebate, what's my next step? Contact us at your earliest convenience. We will answer all of your questions and get you set up with an agent who specializes in the area you are looking to buy. You can always expect us to be responsive and accommodating. We want you to succeed with your home purchase and save on your closing costs too. Can I meet my assigned buyer's agent first? Yes. Please contact us to get started. Once we pair you with a local specialist, he or she will be your main point of contact as you navigate the rest of the way through the offer process. Are buyer’s agent commission rebates legal? Yes, commission rebates are legal in 40 states including the State of New York. It is completely legal in these states both for an agent to offer and for a buyer to accept a commission rebate in conjunction with the purchase of residential real estate. As an investor or developer, do I also qualify for a commission rebate? Yes. You absolutely qualify for a commission rebate. We encourage you to contact us right away to get started with the process. Is my NYC broker commission rebate taxable? The IRS has provided an opinion and determined that real estate commission rebates are generally not taxable. Therefore, a 1099 will likely not be issued to you in conjunction with the home buyer rebate you receive for purchasing a property. In many cases, especially in New York City, the size of your commission rebate can be a tremendous amount of money. Keep in mind that we cannot offer specific tax or legal advice. The IRS ruling we made reference to can be found here. Where does the money for the rebate come from? Your commission rebate actually comes from the seller. The seller has usually agreed to pay 6% commission per their listing agreement, regardless of where the buyer comes from. So if you placed an offer on your dream property without being represented by a buyer’s agent, the 3% commission which would have been shared with your agent actually goes into the pocket of the listing agent. We encourage you to contact us right away so that we may get you started on the path towards getting paid to purchase your new apartment, co-op or (if you are lucky) brownstone or townhouse! What if another buyer's agent already showed me the property that I want to buy? You are allowed to switch representation at any time in New York City. That’s because working with an exclusive buyer’s agent or signing any sort of exclusivity agreement is extremely rare for buyers. If the property you already saw is a new development, you may be required to inform the sponsor or listing agent in writing that you have decided to switch buyer representation. Should I speak with a mortgage broker and request a pre-approval letter before looking at properties? Yes, this is something we highly recommend. A mortgage broker or bank’s pre-approval letter is always required to be presented with any offer. If you do not already have a mortgage broker you are working with, we encourage you to contact us so we may pair you with one who specializes in your area. Absolutely not. It is extremely important to realize that our partner brokers are all traditional brokerages that primarily focus on full commission work. They never openly discount nor tarnish their reputations in any way by openly offering to work for less. They have discreetly agreed to offer a discount to Hauseit customers. As a result, the sellers and listing agents will never know you are receiving a rebate unless you decide to disclose it! What if I don’t like the agent I am working with? We will find you a new agent in 24 hours or less. While we do our best to pair with you an agent who specializes in the area and gets along with you personally, we agree that sometimes things don’t work out. So just send us a message and you will have a new agent in 24 hours. And don’t worry, nobody will take anything personally. Won’t a seller be irritated that he is effectively paying the buyer some of the commission? Yes, if the seller found out that you’re getting a commission rebate, he or she will likely harbor resentment against you throughout the entire process. Resentment by the seller and listing agent can derail a deal completely. Therefore, it’s important to discreetly receive a commission rebate through one of our brand name, traditional partner brokers who never openly discount or harm their reputations in any way. This way, the seller and listing agent will never know that you are getting a better deal! Do you also offer NYC broker commission rebates for selling a home? 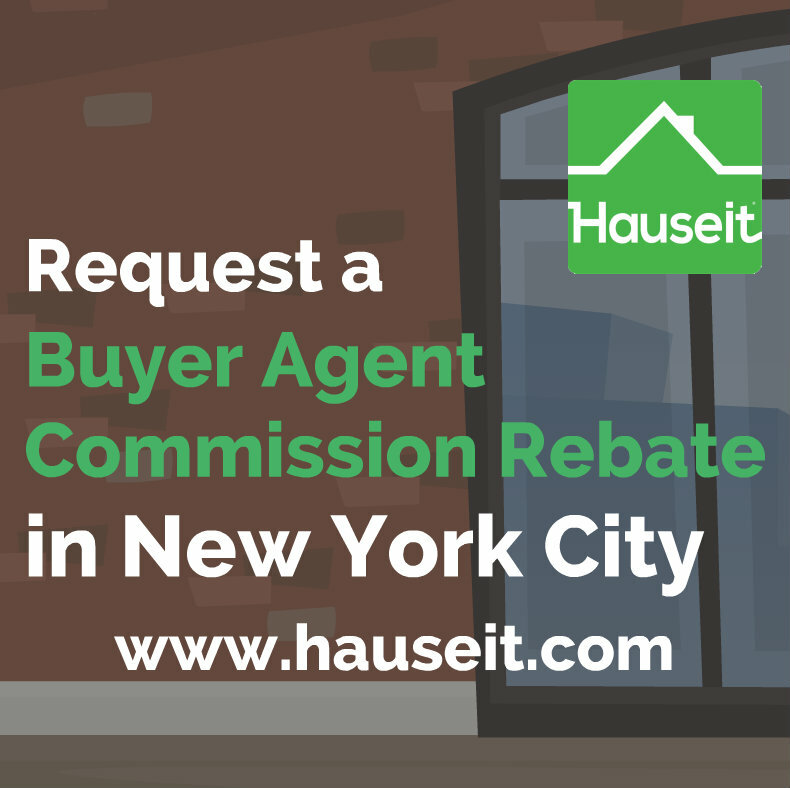 Hauseit helps homeowners sell their properties commission free. We save sellers time and money by listing their property everywhere a traditional agent would for zero percent commission. Our partner brokers even run multiple open houses for you for free, as if you had paid 6% commission! Learn more about our self service listing option today! Too busy to sell your home FSBO? Hauseit offers a full service, traditional listing option through our highly acclaimed partner brokerages for only 1% commission! Do I need to pay any broker fees for using the NYC broker commission rebate service? Absolutely not. There are no fees associated with our service and you never have to spend any money out of pocket. In fact, the only person who gets paid is you! Upon the closing of your purchase, our partner brokers will write you a check because they are willing and able to split the buyer’s agent commission they receive directly with you. Do I need to pay Hauseit anything at all? Zero. Nada. Nothing. We charge nothing upfront or ever, whatsoever. The service is completely free to you and the only person who gets paid is you, with a check discreetly handed to you at closing along with your new front door keys. Who can use Hauseit to buy a home? We invite anyone looking to purchase a home to contact us right away to begin the process. Please note that if you have an exclusive buyer agency contract with another agent or an accepted offer on a property, it may be too late for us to offer you a commission rebate. What properties qualify for a NYC broker commission rebate? The rebate is available on all existing or new construction homes, including condos, co-ops, apartments, brownstones, townhouses, homes and any other building or land which is advertised for sale! Keep in mind that all REBNY listings automatically co-broke 50% of the total commission with buyers’ agents. There is no haggling or negotiation as co-broking rules are contractual among all REBNY Member Firms! How big will my NYC broker commission rebate be? Depending on where you are looking to buy, your rebate can be as big or bigger than a typical year-end bonus. In New York City where the average sale price is $2,000,000, your rebate can $20,000 or more, payable discreetly by check after closing. Why does Hauseit encourage commission rebates for home buyers? Hauseit was formed on the belief that both buyers and sellers alike deserve to be able to take advantage of the development of technology to have a better and more efficient experience when buying and selling real estate. We offer commission rebates to buyers because by doing so we encourage greater competition in the real estate market which ultimately benefits buyers and sellers through lower transaction costs.